A family of four residing in a beautiful Georgian home situated along a leafy road in the center of Primrose Hill had a small guest bathroom on the ground floor which required updating. The clients are members of the hotel in Piccadilly ‘Cafe Royal’ and loved their bathrooms, which are made entirely of Italian marble. As NW3 Interiors are authroised retailers of ‘Neutra Bathrooms’, we could make their dream a reality and deliver a bathroom which met their needs in style and purpose. Adding heat-mats behind the vertical tiles make towels and robes warm, which ensures a luxurious experience. We specified a teak wood storage drawer and created a wide and deep volume to hide hand,bath towels and products neatly away. 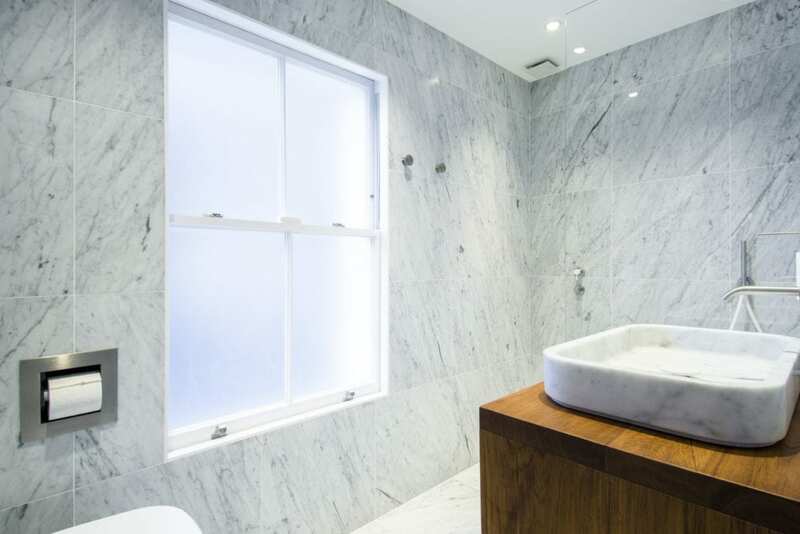 The use of natural marble creates texture and helps to make this bathroom feel and appear more spacious than it is. It is worthwhile for our clients to invest in such materials as they will last forever whilst maintaining timeless in style. Carly designed and project managed the renovation of a guest bedroom and bathroom in my house. I chose her because I know she has impeccable taste, which proved to be the case. Carly really listened to my wants and needs, was very attentive to the budget and liaised closely with the builder. My project was delivered on time and on budget, thanks to Carly’s commitment to keeping the project moving. She is fair and honest and her communication skills great. I have two beautiful new rooms that work as they were supposed to, delivered with minimum fuss on time and on budget.